Dignitaries gather for the traditional “groundbreaking” pose to celebrate the construction of Lancer Lofts. 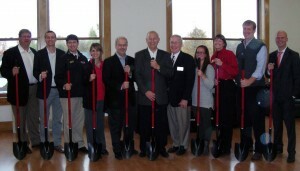 Left to right are: Kevin Scully, Principle & Architect at Design Collaborative; Mark Pohl, Director of Admissions at Grace; Aaron Crabtree, Dean of Students at Grace; Janelle Ditmer, Senior Resident Director at Grace; Bruce Shaffner, Winona Lake Town Board president; Dr. Bill Katip, Grace President; Dr. Jim Custer, Grace College and Seminary Board Chair; Jackie Seal, Student Body President at Grace; Janine Zeltwanger, board secretary; Jim Swanson, vice president of academic and student affairs at Grace; and Drew Mitchell, VP Development at Holladay Properties. 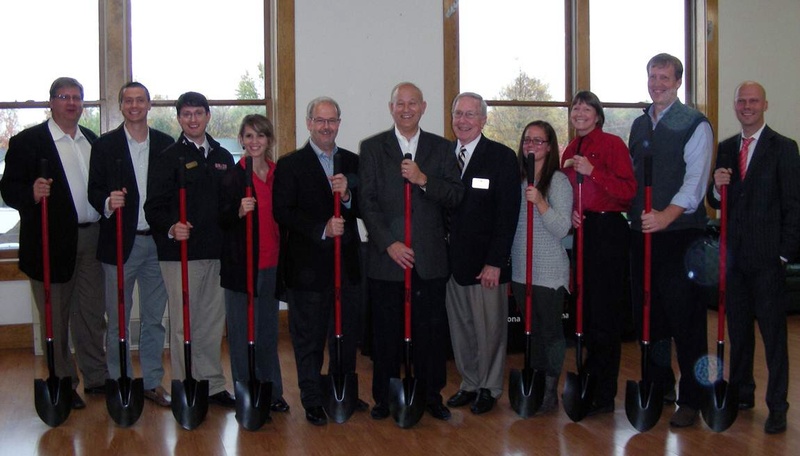 Officials at Grace College and Seminary, Winona Lake, Ind., broke ground on Thursday for a new dorm that will house 80 students in townhouse style living. Rain forced the ceremony inside to a room overlooking the proposed dorm site in Mount Memorial Hall.